Imatest can return pass/fail (P/F) results for industrial inspection or for any tests where pass/fail results are required. Although pass/fail is primarily intended for IT (DLL and EXE), it works with GUI-based versions of Imatest (except for Studio), where it can be particularly useful for testing P/F thresholds for Imatest IT. 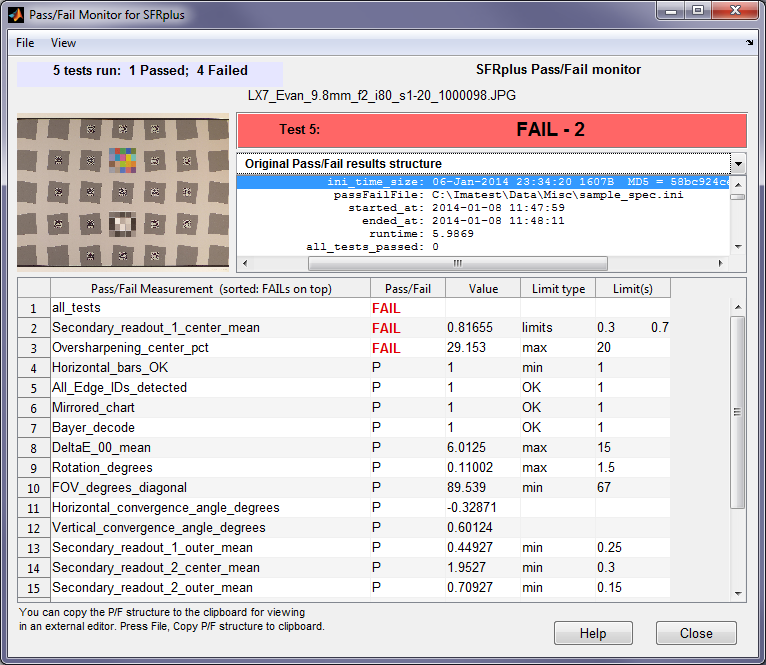 Starting with Imatest 4.0, the Pass/Fail monitor lets you examine P/F results in detail. [section] corresponds to the module, where supported modules are listed below. Because this file contains values for the camera specification, it is often called a “spec.ini” file. The pass/fail ini file must be maintained by the customer (for now, at least) using a text editor or the Imatest INI File Editor. In some cases you may be given a file that you will need to save. This can be done by clicking Settings, IT settings in the Imatest main window, then entering the full path name in the appropriate box. Information about the Unit Under Test (UUT) must be passed to Imatest in the same JSON object (string) used to pass image array properties to Imatest DLL modules. The UUT part number, serial number, pass/fail settings, results value, and pass/fail results (1 or 0) are returned to the calling program in a JSON object. XML may be added on customer request. A Pass/Fail monitor (shown on the right) can display Pass/Fail results and (if selected) history in realtime in GUI versions of Imatest, as soon as results are calculated. [multi] Multicharts and Multitest color/grayscale modules. There are similar entries in [colorcheck] and [stepchart]. Pass/Fail settings— minimum, maximum, or limit (min and max) values for individual measurements— are stored in an ini file that is separate from the main ini settings file so it can be protected from tampering, if needed. It can be in a protected folder that requires administrator access to write. There are a few settings with different formats— kept for backwards compatibility. Here is an example. Parameters are listed in the Pass/Fail Reference, below. For example, MTF50P_ratio_min = .5 sets the minimum acceptable value for (minimum MTF50P)/(maximum MTF50P) (taken over all the selected regions) to 0.5. The customer must update this file to meet his needs. Additional measurements will be added on request. Additional measurements can be added on customer request. [sfrreg], and [checkerboard], and [sfr] are subsets of SFRplus. Settings used by all modules (mostly MTF-related) have no special annotation. (+) denotes SFRplus; (e) denotes eSFR ISO; (C) denotes Checkerboard. ( (+e) are mostly derived from color and grayscale patterns; (+eC) are mostly geometry). Minimum and maximum mean pixel levels for the chart, measured in the middle third (ninth by area) of the chart. Set to avoid cheating by over (or under) exposing so edges saturate (sharp corners), resulting in improved MTF. Offset of chart center (from image center) in pixels. Gamma_from_slanted_edges_mean_min Minimum mean value of the mean gamma (contrast), measured from all slanted-edges where gamma can be measured (chart contrast ratio must be entered). Indicates fogging. Not calculated if the light and dark regions are too small. This can be an issue with SFRreg with large edge angles. We recommend Wider or Widest ROI width (instead of Normal). Gamma_from_slanted_edges_min_min Minimum value of the minimum gamma (contrast), measured from all slanted-edges (chart contrast ratio must be entered). Indicates fogging. MTF50_min_min Minimum value of MTF50 (in selected units) for all selected edges. MTF50P_max_max Maximum value of MTF50P (in selected units) for all selected edges. MTF50P_min_min Minimum value of MTF50P (in selected units) for all selected edges. The minimum ratio of the minimum to maximum MTF50P (spatial frequency where contrast falls to half its peak value). A low value indicates poor lens quality or possibly significant lens tilt. MTF50P_CP_weighted_mean_min = .13 The weighted mean MTF50P in Cycles/Pixel. Image rotation in degrees, measured from the top and bottom distortion bars. The absolute value is used for Pass/Fail. Note that if the chart is upside-down (vertically mirrored or rotated 180 degrees) 180 will be added to the rotation, which will generally result in a failure for this measurement. The maximum allowed convergence angle (both Horizontal and Vertical are measured). A measure of keystone distortion. The minimum allowed value of the mean of Secondary readout 1 anywhere in the image. Secondary readouts are described Here. Secondary readout ini file settings are listed in the Imatest INI file reference. Secondary_readout_1_center_mean_min = .2 The minimum allowed value of the mean of Secondary readout 1 in the center region (<30% of the center-to-corner distance). The minimum allowed value of the mean of Secondary readout 2 anywhere in the image. Secondary_readout_2_center_mean_min = .2 The minimum allowed value of the mean of Secondary readout 2 in the center region (up to 30% of the center-to-corner distance). Horizontal_bars_OK_min = 1 (+) (+) Test for properly detected top and bottom bars (present with no significant gaps). Test for mirrored (Left-Right or Top-Bottom) image (fails mirrored images) if entered and the chart contains a grayscale step chart below the center square and stepchart = 1 in the [sfrplus] section of the main ini file. Test for correct Bayer pattern decoding (fails if incorrect) if entered and the chart contains color patches above the center square and colorchart = 1 in the [sfrplus] section of the main ini file. A color pattern is expected above the chart center when colorchart = 1 in the [sfrplus] section of the main ini file. If the color pattern is not present, this test will fail. This could indicate bad chart positioning or simply that the color pattern is not present in the test chart. ΔE 2000 Color accuracy. For best results use a color reference file generated from multicharts. A grayscale stepchart is expected below the chart center when stepchart = 1 in the [sfrplus] section of the main ini file. If the stepchart is not present, this test will fail. This could indicate bad chart positioning or simply that the grayscale stepchart is not present in the test chart (a rare occurrence because it’s in most standard charts, except for the chrome-on-glass chart). If set, fail the image if an upside-down condition is detected. passfail_ini_file_date = (manually entered date) Optional indicator of pass/fail date. Another result appears in the output: passfail_ini_time_size, which contains the time the file was modified and the size in bytes. [blemish] and [uniformity] Uniformity is a subset of Blemish. Settings also available in [uniformity] are indicated by (*). Dead_pixels_max = 10 (*) Maximum number of dead pixels allowed. Thresholds for dead pixel detection (% or absolute) are set in the [blemish] section of the ini file. Maximum number of dead pixel clusters allowed, where a cluster is defined as two or more adjacent dead pixels. Overrides the calcluster setting in the standard ini file: calcluster(2) is set to 1 if entered. Hot_pixels_max = 10 (*) Maximum number of hot pixels allows. Thresholds for hot pixel detection (% or absolute) are set in the [blemish] section of the ini file. Maximum number of hot pixel clusters allowed, where a cluster is defined as two or more adjacent hot pixels. Overrides the calcluster setting in the standard ini file: calcluster(1) is set to 1 if entered. Relative_illumination_worst_corner_pct_min = 40 (*) The minimum corner region luminance divided by the maximum luminance of the smoothed image. Uniformity_RoverG_corners_pct_max = 10 (*) Maximum R/G corner nonuniformity = 100%(RGmax – RGmin)/RGmax, where RGmax = maximum R/G ratio in the four corners; RGmin = minimum R/G ratio in the four corners. Uniformity_BoverG_corners_pct_max = 10 (*) Maximum B/G corner nonuniformity = 100%(BGmax – BGmin)/BGmax, where BGmax = maximum B/G ratio in the four corners; BGmin = minimum B/G ratio in the four corners. R_div_G_ctr_corner_diff_pct_max [v4.3+ Bayer RAW] Maximum R/G center & corner difference % = 100%(RGmax – RGmin)/RGmax, where RGmax = maximum R/G ratio in center & corners; RGmin = minimum R/G ratio in center & corners. R_div_G_ctr_corner_diff_pct_mean_max [v4.3+ Bayer RAW] Maximum R/G center & corner difference % = 100%(RGmax – RGmean)/RGmax, where RGmax = maximum R/G ratio in center & corners; RGmean = average R/G ratio in corners. B_div_G_ctr_corner_diff_pct_max [v4.3+ Bayer RAW] Maximum B/G center & corner difference % = 100%(BGmax – BGmin)/BRGmax, where BGmax = maximum B/G ratio in center & corners; BGmin = minimum B/G ratio in center & corners. B_div_G_ctr_corner_diff_pct_mean_max [v4.3+ Bayer RAW] Maximum B/G center & corner difference % = 100%(BGmax – BGmean)/BGmax, where BGmax = maximum B/G ratio in center & corners; BGmean = average B/G ratio in corners. R_div_B_ctr_corner_diff_pct_max [v4.3+ Bayer RAW] Maximum R/B center & corner difference % = 100%(RBmax – RBmin)/RBmax, where RBmax = maximum R/B ratio in center & corners; RBmin = minimum R/B ratio in center & corners. R_div_B_ctr_corner_diff_pct_mean_max [v4.3+ Bayer RAW] Maximum R/B center & corner difference % = 100%(RBmax – RBmean)/RBmax, where RBmax = maximum R/B ratio in center & corners; RBmean = average R/B ratio in corners. Center_R_div_G_unnorml_limits Range [min max] of allowable values for center R/G ratio. Values are unnormalized. Center_B_div_G_unnorml_limits Range [min max] of allowable values for center B/G ratio. Values are unnormalized. R_ctr_corner_diff_pct_max [v4.3+ Bayer RAW] Maximum Red center & corner difference % = 100%(Rmax – Rmin)/Rmax, where Rmax = Mean Red in center; Rmin = Lowest mean R value in corner. R_ctr_corner_diff_pct_mean_max [v4.3+ Bayer RAW] Maximum Red center & mean corner difference % = 100%(Rmax – Rmean)/Rmax, where Rmax = Mean Red in center; Rmean = Average mean R value in corners. Gr_ctr_corner_diff_pct_max [v4.3+ Bayer RAW] Maximum Green(red) center & corner difference % = 100%(Grmax – Grmin)/Grmax, where Grmax = Mean Green(red) in center; Grmin = Lowest mean Gr value in corner. Gr_ctr_corner_diff_pct_mean_max [v4.3+ Bayer RAW] Maximum Green(red) center & mean corner difference % = 100%(Grmax – Grmean)/Grmax, where Grmax = Mean Green(red) in center; Grmean = Average mean Gr value in corners. Gb_ctr_corner_diff_pct_max [v4.3+ Bayer RAW] Maximum Green(blue) center & corner difference % = 100%(Grmax – Gbmin)/Gbmax, where Gbmax = Mean Green(blue) in center; Gbmin = Lowest mean Gb value in corner. Gb_ctr_corner_diff_pct_mean_max [v4.3+ Bayer RAW] Maximum Green(blue) center & mean corner difference % = 100%(Gbmax – Gbmean)/Gbmax, where Gbmax = Mean Green(blue) in center; Gbmean = Average mean Gb value in corners. B_ctr_corner_diff_pct_max [v4.3+ Bayer RAW] Maximum Blue center & corner difference % = 100%(Bmax – Bmin)/Bmax, where Bmax = Mean Blue in center; Bmin = Lowest mean B value in corner. B_ctr_corner_diff_pct_mean_max [v4.3+ Bayer RAW] Maximum Blue center & mean corner difference % = 100%(Bmax – Bmean)/Bmax, where Bmax = Mean Blue in center; Bmean = Average mean B value in corners. [colorcheck] Used for Colorcheck. These entries are identical to [multi], used for Multicharts and Multitest. Additional entries for [multi], not in [colorcheck] will be added below as they become available. gamma_limits = .4 .7 Minimum and maximum values for gamma. [multi] Used for Multicharts and Multitest color/grayscale modules. All the settings shown above for Colorcheck are also available. Additional settings will be entered below, as they are programmed. If you need additional P/F parameters, we recommend that you look at the JSON output of Multicharts/Multest for available variables. Minimum and maximum values for gamma. [stepchart] for Stepchart. Some entries similar to [multi]. The main ini settings file should contain the [api] section, which includes the Pass/Fail settings file location. Each test may have a part number and serial number (both strings) that identifies the UUT (Unit Under Test). The part and serial numbers are passed to Imatest IT along with the image file and data that defines the size of the image. It is contained inside a JSON object, as shown in the example below, written in Matlab. C, C++ etc. examples will be supplied with Imatest IT builds. % Start by reading an image as a binary file. jstr.width = 1280; jstr.height = 720; jstr.ncolors = 1; % Not used for raw files. jsonObj = savejson(”,jstr,); % Convert structure into JSON object. fd = fopen(rdfname, ‘r’, endian_str) ; % Open the image file for reading. [ im_orig count ] = fread(fd, inf, precision) ; % inf allows bits to be skipped. Note: jstr.extension = ‘rw3’ refers to the file extension, whose decoding parameters are set in Generalized Read Raw setup. jstr.width = 1280; jstr.height = 720; jstr.ncolors = 1; are not used for raw files decoded by Generalized Read Raw. They are used to decode processed images in standard formats. There are occasions where we may want to override settings in the main ini file (C:\Imatest\projects\sfrplus\SFRplus_5_rw3.ini in the above example) at runtime, for example, when several different images are to be analyzed in sequence. This can be done with statements in the calling sequence. The three variables shown below in burgundy are currently supported. (The fields, i.e., crop_borders, lens_to_chart_diatance_cm. etc.) must be entered exactly as shown (they’re hard-coded into the program). More can be added on request. The available output is being expanded. It will eventually include both JSON and XML objects.